Opposing managers Stephen Kenny and Stephen Bradley. BOTH SHAMROCK ROVERS and Dundalk would love to get their hands on silverware at Tallaght Stadium later today — but for very different reasons. Having won five major trophies in the past three years, the current Lilywhites team will go down in history as one of the all-time great sides. 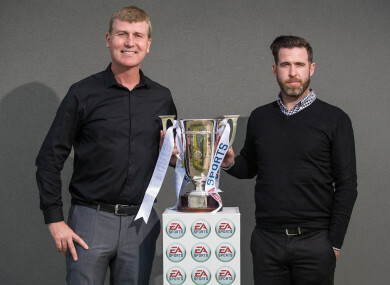 However, with title rivals Cork City on the brink of securing the Premier Division after Dundalk’s three-in-a-row, Stephen Kenny will aim to make do with a cup double — EA Sports Cup and FAI Cup — while finishing runners-up in the top flight. And it’s Rovers who stand in their way this afternoon and then in the last-four of the country’s premier cup competition on 1 October. “I don’t take for granted the opportunity to play in finals,” Kenny said this week. “Dundalk weren’t in a major final for 12 years and just because we’ve had a period of being in finals, we should never take it for granted. It’s the nature of football. “We won’t be saying ‘win this cup to give us a boost for next season’. We want to win it on its merits. Every one of them could be your last because you never know in life. “The players’ attitude has been very good even going back to the first round when we won on penalties against UCD in a game we dominated, with Ciaran Kilduff missing a penalty too. We’re here now and I think this Dundalk team has evolved. It’s not the same team every year, but it has been one of the great teams in the history of football in Ireland. How do you measure it? We won three-in-a-row, Shamrock Rovers won four-in-a-row, Waterford won five-in-a-row. Are they the best ever? Maybe they are. Certainly from our point of view, I don’t take for granted the opportunity to be in any final or play in Europe. Dundalk midfielder Robbie Benson has echoed his manager’s sentiments about grasping the opportunity to add to their trophy cabinet. “I think if you offered any club in the league — bar maybe ourselves because we had won the league and wanted to retain it — second place and two trophies, they would have snapped your hand off. In 20 years’ time, I think they’d look back on that season as a really memorable one. A special one. In stark contrast, the game represents a chance for many of a young Rovers side to taste success for the first time in senior football. The club’s last piece of silverware came in this competition four years ago — with a 3-0 win over Drogheda United. Manager Stephen Bradley appears to have found a formula that works in recent weeks and they come into the fixture on a seven-game winning streak. His belief is that this group of players will benefit hugely if they can get a cup win under their belts. I’ve made no secret our next thing was to win something as a group,” Bradley said. “When we sat down to set our targets it was to beat the top teams and go on certain runs. We’ve done that and our next one is to win something as a group. “I believe it grows the group very quickly. Stephen [Kenny] showed that by winning this [cup] and I think it showed with Cork last year in the FAI Cup. The Hoops have home advantage for the game, but Bradley was eager to play down its significance. “I think people make too much of home or away, to be honest,” he maintains. “Unless it’s Cork away or Finn Harps away and you’ve the travel aspect, it’s 11 v 11. They’ll have good support, we’ll have good support. It’s a good pitch, with two good teams. As you would expect, his opposite number has different thoughts on the matter. On the injury front, Rovers have defender Lee Grace cup-tied, while Graham Burke misses out with a knee injury. Gary Shaw sat out the recent FAI Cup quarter-final win over Bluebell United with a broken cheekbone but he should be available — albeit wearing a protective face mask. Dundalk have Dylan Connolly, a recent signing from Bray Wanderers, cup-tied and both John Mountney (osteo pubis) and Dane Massey (medial ligament strain) are doubts. Email “ 'This has been one of the great teams in the history of football in Ireland' ”. Feedback on “ 'This has been one of the great teams in the history of football in Ireland' ”.